In 1948, five miles north of El Paso, on the old highway to Las Cruces, New Mexico, we began cooking authentic Mexican food for friends, family, and wayward travelers. 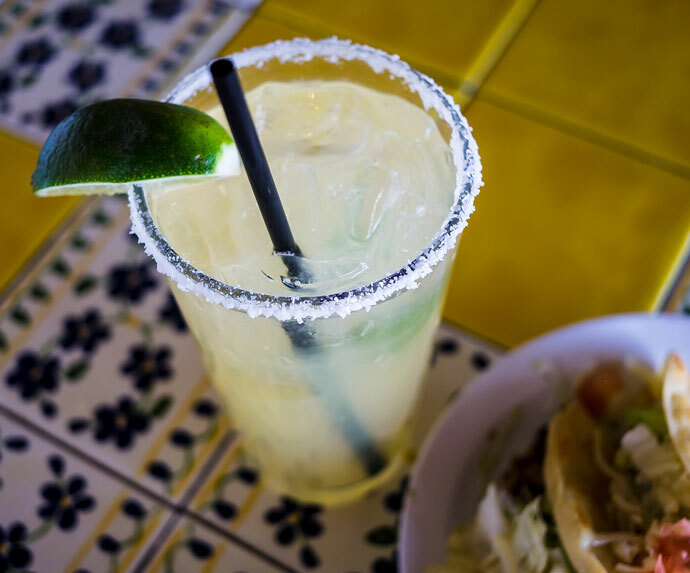 Today, almost 65 years and a few generations later, our reputation for serving the finest in authentic Mexican cuisine still exists. In an age of prefabricated chain restaurants looking to replicate the look and feel of an iconic local haunt, one step into the “Riv” tells you that the atmosphere and food remain as authentic and local as ever. Cheese, jalapeños, tomatoes, and onions. Three large buttermilk pancakes. Try them with our blueberry or strawberry topping! Our most popular breakfast plate. Two eggs topped with either salsa roja or salsa verde served on top of corn tortillas topped with shredded, melted cheese. Our delicious fresh salsa & warm tostadas. Served complementary with every meal! Three crunchy shredded beef flautas served with refried beans, rice, guacamole, and sour cream. Our juicy char-boiled burger topped with white cheddar, bacon, and guacamole on a toasted pretzel bun. Served with french fries. Our signature enchiladas stuffed with chicken and topped with our New Green sauce. Served with refried beans and rice. Our signature enchiladas stuffed with white cheddar and topped with our Original Red sauce. Served with refried beans and rice. Plates come with one of the following sides: Papas con chile Verde, hash browns, refried beans, or Charro beans. Add second breakfast side to any plate for an additional .75 cents. * Egg whites available for the health-conscience. 1/4 pound of sirloin steak tips served ala Mexicana (tomato, onion, and jalapeño) with your choice of flour or corn tortillas. 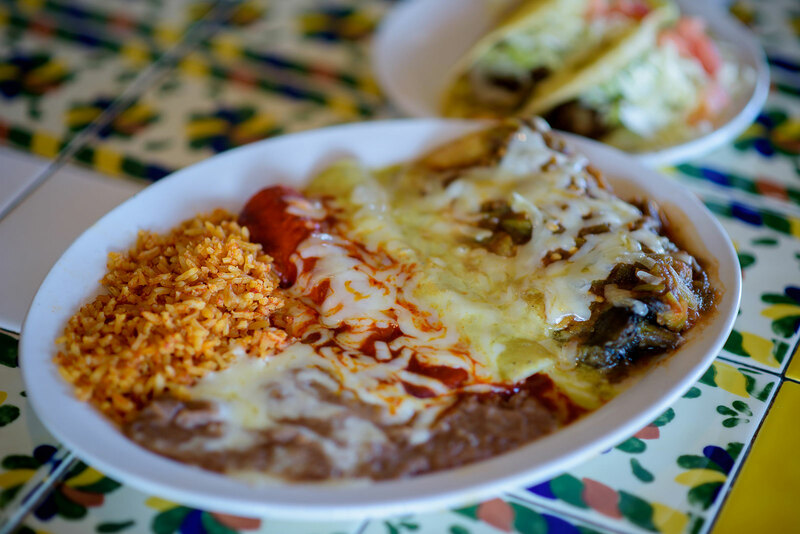 Two flat enchiladas topped with either salsa roja or salsa verde served with one egg on top any style. Two scrambled eggs mixed with white cheddar, shredded beef, onions, tomatoes and rajas de chile verde. (available Saturday and Sunday only). Served with Mexican Toast, lemons, onions on the side, and dried red chile. Three scrambled eggs combined with chorizo sausage. Two eggs any style on top of shredded corn tortillas and topped with either salsa roja or salsa verde. Two Handmade tamales and two eggs. Choose from red pork, green chicken, or chile con queso tamales. Three corn tortilla enchiladas stuffed with cottage cheese and topped with salsa roja or salsa verde and cheese. Ground Beef with tomatoes jalapeños, and onions topped with cheese and served with two eggs any style. All Omelettes are three eggs or more and come with one of the following breakfast sides: papas con chile verde, hash browns, refried beans, or whole beans. Add second breakfast side to any plate for an additional .75 cents. For calorie conscious, egg whites may be substituted on any plate at no additional charge. Ham, Bell peppers, onions, mushrooms and cheese. Long Green Chile, tomatoes, onions, and cheese. Egg whites, green peppers or jalapeños, onion mushrooms, tomatoes and cheese. Eggs, bacon bits, and cheese. Seasoned chicken or skirt steak, onions, green peppers, tomatoes. * These plates do not come with sides. Two eggs any style, bacon or sausage patties, and wheat or white toast. Substitute one pancake or two slices of French toast for $0.99. Skip the bacon or sausage for $5.79. Smoked ham steak served with two eggs any style. 10oz. ribeye served with two eggs any style. 8oz. breaded chicken fried steak topped with country gravy or chile con queso and served with two eggs any style. Six homemade triangles of French toast and dusted with powdered sugar. Three large buttermilk pancakes. Add blueberry or strawberry topping for $.75. Add egg for $.99. Three large Multi-grain pancakes. Add blueberry or strawberry topping for $.75. Add egg for $.99. Steak tips with grilled onions, tomatoes, guacamole and cheese. Egg and cheese and up to three of the following: tomatoes, jalapeños, green chile, onions, diced ham, bacon and sausage, chorizo. Shredded beef, tomato, onions, green chile and chile con queso and eggs. Two chile rellenos and refried beans. Beef or chicken fajita meat, green and red peppers, grilled onions, and guacamole. Grounded beef with pot beans and chile con queso. Ground beef with tomato, onions, jalapeños and cheese. Beef fajita or chicken fajita, guacamole and sour cream on the side. Tortilla chips topped with refried beans and white cheddar. Add grilled steak or grilled chicken with jalapeños and diced tomatoes. Served with guacamole and sour cream. Homemade tortilla chips topped with refried beans, white cheddar and jalapeños, served with guacamole. Add ground beef or chicken for $1.50 more. A generous serving of guacamole from three whole avocados. Served with pico de gallo and homemade tostadas. Steak tips, chicken fajitas or carnitas grilled with onions, jalapeños, and tomatoes on top of our traditional Chile con Queso. Choice of corn and flour tortillas. White cheddar salsa of grilled: rajas de chile verde, tomatoes and onions. Choice of corn or flour tortillas. A blend of melted cheeses mixed with rajas de chile verde, tomatoes and onions. Tortillas with white cheddar, rajas de chile verde, gilled and with another tortilla. Add beef or chicken for $1.59. Your choice of Sweet & Spicy, Chipotle Ranch or Red Cilantro Lime. 8 wings per order. Comes with ranch, blue cheese or our very special "salsa" %.50 for extra blue cheese or ranch. Served Mexican style with avocado. Add a shot of Texas Absoulut for $1.50. Sirloin tips over three steamed corn tortillas topped with sautéed onions and cilantro. Served with refried beans, rice, sour cream, and guacamole. Three tacos with your choice of ground beef, shredded chicken, beans or guacamole. Served with refried beans and rice. Three shredded beef tacos with shredded lettuce and tomatoes served with refried beans, rice, and cheese. Three steamed corn tortillas with chicken breast, lettuce, tomatoes, and cheese. Served with whole beans and rice. Three tacos served with rice and beans. Choice or Pastor ground beef, shredded beef, shredded chicken, bean, guacamole, or sliced avocado. Three tacos served with lettuce, tomatoes, and cheese; choose from ground beef, chicken, bean, guacamole or sliced avocado. Add shredded beef add $1.50. Three tacos or tilapia on a steamed tortilla topped with cilantro and chopped cucumbers. Served with rice and refried beans. Shredded beef with corn or flour tortillas on the side, served with refried beans, guacamole, and sour cream. A 50 year Riviera specialty. Three pork tacos, served on steamed corn tortillas, served with grilled onions, cilantro, avocado, refried beans and rice. All of these items in this section come with two sides. 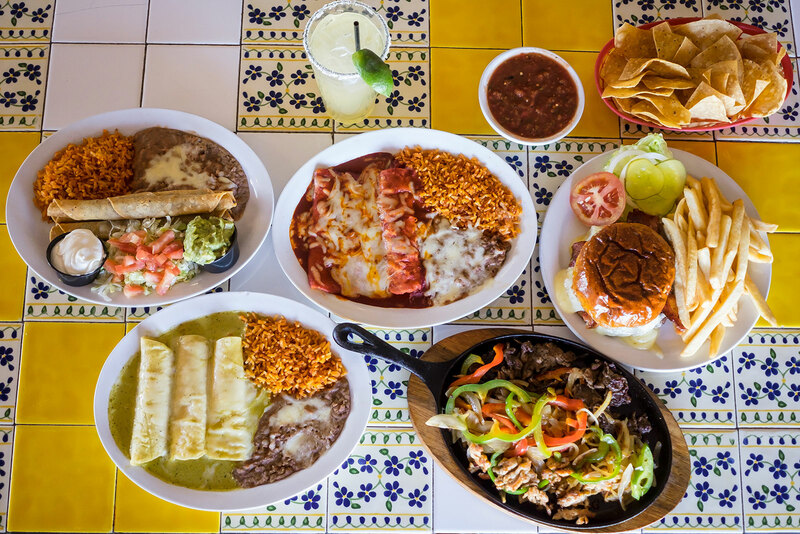 Choose from refried beans, whole beans, rice, cole slaw, french fries or side salad. With corn or flour tortilla. 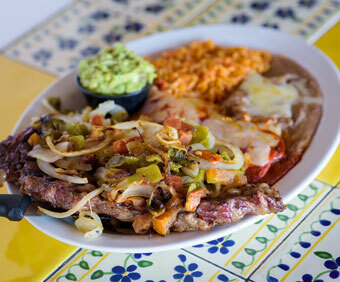 10-ounce ribeye topped with rajas de chile verde, onion, tomatoes, one enchilada, and guacamole. 10-ounce ribeye topped with gringo queso or traditional chile con queso. Grilled sirloin tips with grilled rajas de chile verde, onion and tomatoes served with enchilada. 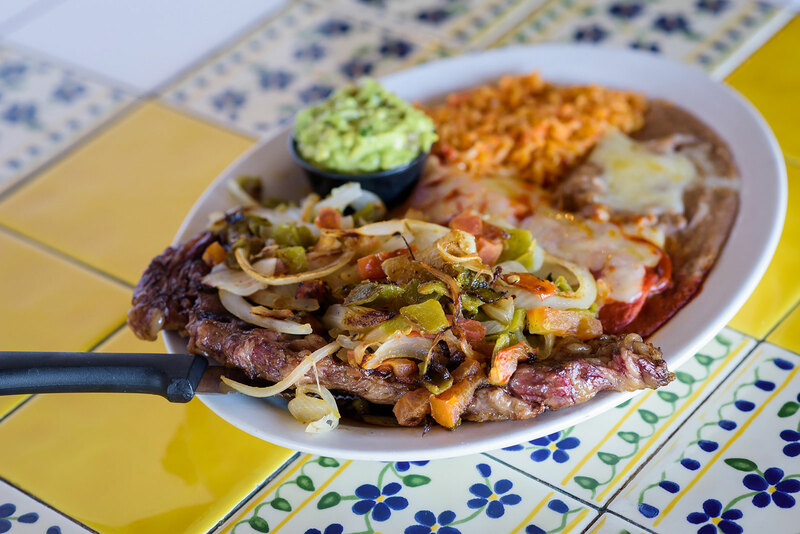 ¾ pound ground chuck steak in chile con queso or topped with green chiles and onions. Half pound of beef or chicken grilled with green peppers and onions; served with rice, whole beans, guacamole, and sour cream. 8-ounce breaded beef filet with gravy or chile con queso. Diced chicken breast, carrots, and potatoes, topped with tortillas strips, white cheddar, cilantro and avocado slices. A "Riv" favorite. Beef sirloin tips with potatoes and rajas de chile verde, served with tortillas and your choice or rice or refried beans. Pair any salad (side) and cup of soup. Ensalada Mexicana not available as side salad. Salad or tomatoes, cucumbers, and sliced avocados; topped with white cheddar. Your choice beef or chicken fajita. Whole beans, shredded lettuce, chopped tomatoes, beef or chicken taco filling, a splash of Chile Colorado and topped with white cheddar in a flour tortilla shell. Mixed greens, tomatoes, cucumbers, and avocados. Topped with grilled chicken breast and white cheddar. Grilled rajas de chile verde, onions and tomatoes; served with guacamole, beans and rice. One half of chicken marinated in our mesquite spice recipe; served with rice, whole beans, guacamole, tortillas. All of our burgers are half pound or larger, char-boiled and served on toasted pretzel bun; with French fries. Add our gringo queso in lieu of cheese for $1.25, or add sliced avocado, bacon or green chile for $1.25 each. Cheeseburger with white cheddar served with rajas de verde. Cheeseburger with white cheddar and grilled jalapeños. Cheeseburger with chipotle pepper sauce patty and white cheddar. Topped with white cheddar, bacon, and guacamole. Organic vegetable patty topped with white cheddar and side of salad. Grilled chicken breast, topped with onions, mushrooms, white cheddar, bacon on a grilled bun with ranch. Grilled chicken breast, topped with avocados, tomatoes, and white cheddar. Chile verde stuffed with white cheddar, dipped in batter and lightly fried. 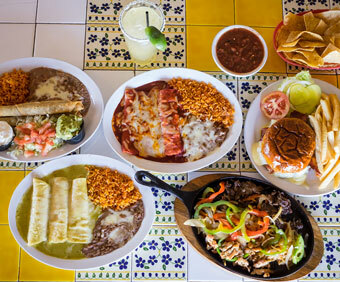 Comes with two rellenos, rice, beans, and flour or corn tortillas. Three tamales, choose from green chicken, chile con queso tamales or red pork with your choice or original red, green creamy jalapeño, or old green rajas de chile verde sauces. Chile Colorado is our specially seasoned red sauce, marinated pork and served with refried beans, rice, flour or corn tortillas. Flour tortilla filled with picadillo beef or shredded chicken; served with refried beans and rice. A Riviera favorite. Add chile con queso $1.50. Three flautas filled with shredded beef or chicken served with refried beans, guacamole, and sour cream. Made from corn masa, it can be stuffed with beef or shredded chicken, guacamole, beans, or sliced avocados; served with rice and beans. Choose your salsa: Original Red, New Green or Old Green (rajas de chile verde). All orders come with three enchiladas. Served with rice and beans and for extras: sour cream 50 cents more, egg 99 cents more. Flat enchiladas with white cheddar. Shredded chicken with white cheddar. Ground chuck with white cheddar. Ground chuck with jalapeños, onions, tomatoes and white cheddar. Two tacos, two cheese enchiladas; served with your choice of beans, rice, or slaw. 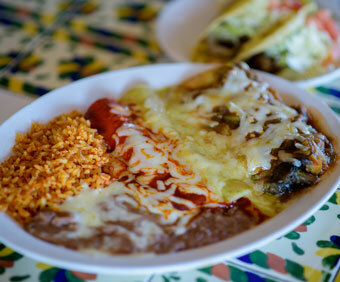 Two tacos, two cheese enchiladas, one homemade chile relleno; served with refried beans, rice or slaw. One taco, one cheese enchilada, one chile relleno and one tamale; served with refried beans, rice or slaw.